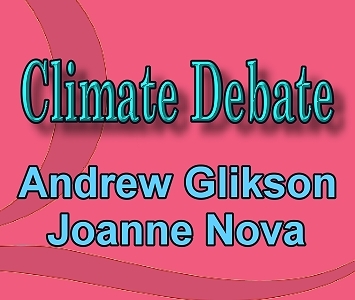 The climate debate began when Quadrant Online published “Case for Climate Change” by Andrew Glikson, and a reply by Joanne Nova “No, Dr Glikson”. Andrew Glikson: At the roots of the climate debate is the precautionary principle. People insure their homes for small probabilities of loss. Nations build armed forces in connection with possible future contingencies. When faced with directly observed evidence of climate change, which led the premier science research bodies to warn the world of the consequences of the continuing emission of billions of tons of carbon, we better take note. Joanne Nova: The best, most detailed information we have from hundreds of studies, thousands of boreholes, kilometres of ice cores, and hundreds of thousands of weather balloon and satellite recordings tells us that it’s likely there is little risk of catastrophic warming, and little benefit in reducing carbon emissions. Therefore, we should do only the easy, cheap things to reduce emissions, while keeping watch on the data, and focus our efforts instead on real problems. The debate continued with “Credibility lies with experienced authorities” by Andrew Glikson, and “Credibility lies on evidence” by Joanne Nova. Andrew Glikson: As in other fields of science and technology, credibility lies with the respective experienced authorities and is protected, as much as humanly possible, by the peer review system. Joanne Nova: Andrew Glikson backs his arguments with weak evidence and logical errors. Instead of empirical evidence, often he quotes authoritative reports written by glorified committees. The debate concluded with “Effects of CO2 on climate” by Andrew Glikson, and “Depending on flawed models” by Joanne Nova. Andrew Glikson: It appears the differences in views regarding the reality and origin of global warming are of a quantitative nature rather than qualitative nature. Joanne Nova: The totality of “evidence” comes down to climate models that don’t agree with the observations and ever more ancient geological studies which may or may not show an effect but are simply unable to resolve details that we need.